"I just need to get this stuff out of the way." Technology level: Comfortable with technology: email, im, office applications, surfs the web, uses keyboard shortcuts often. Profs that don't know how to use Moodle so their behaviors in using some features is inconsistent. Grades are hidden down in the tools even though they are so important. Having to use more than one LMS like last term when a class used CCNet. Print out power point slides in notes format prior to lecture so she can take notes directly on the ppts. Customize look and feel of courses in Moodle -- she particularly likes to make everything purple. Use keyboard shortcuts to copy and paste. Use forums to find other students that live close to her (instructor sets them up). Read other students questions to instructor along with the answer. Refer to course outline on course site. Review TA corner in the course website for additional course notes. Copy and paste assignment instructions from the course site to word for reference offline. Ashley is in her 2nd year at U of T, studying archeology. She lives with her parents at home in Richmond Hill and commutes. She's keeping her fingers crossed to get an apartment on campus next year with some friends. In her free time she like to spend as much time with her friends as she can but living off campus can make it more difficult. She also likes to blog and participate in online forums outside of school when she can find the time. She's been blogging for 7 years and really enjoys it. She likes to maximize the use of her time on her 40 minute commute by reading or doing something productive -- typically she does some sort of studying. 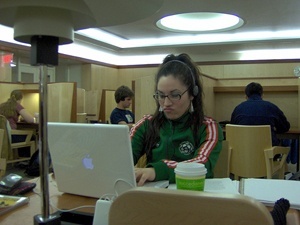 Once on campus, Ashley normally does her course work with a group of friends in the Student Learning Centre. She likes areas with lots of big tables, so she can sit around with her classmates, work on assignments together, talk out loud, and eat. Even if they aren't studying the same subject they still like to study together. She studies in groups like this for a few hours every day. She goes to the library to study by herself during exam times. She also frequents the libraries and computer labs throughout the day to check email and facebook. She's got favorite public computer spots located close to most of her classes. On occasion she brings her laptop to school and if so she uses it for school work, socially interacting with people (via Facebook, MSN), and email rather than a public computer. She has configured her Firefox to show all of her favorite web sites and applications, such as livejournal blog, facebook, banking, email accounts, weather, and Moodle when she opens it. The downside to using the public computers is she can't personalize them in that way but her laptop can get pretty heavy to carry around all day so she puts up with it. She finds herself using keyboard shortcuts for efficiency more and more, particulary for common tasks like copy and pasting or when she a lot of windows or tabs open and needs to switch between them. She always has her phone with her but it doesn't have email capabilities. She does find herself text messaging more and more rather than email since it's more immediate. Although Ashley likes using her computer for staying in tough with friends, surfing the web and doing most of her homework, there are some activities she prefers to do the "old-fashioned" way, like taking notes and reading. She likes instructors who post their lecture PowerPoint slides ahead of class, so she can take notes directly in or on them. It makes studying later much easier. She usually prints out the lecture slides and takes hand written notes. If she has her laptop at school, she takes notes directly in PowerPoint or in Word if the slides aren't available ahead of time. She like using hard copy for reading so she can highlight as she reads. It's also handy on her commute rather than trying to pull out her computer on the bus. She may type up a summary later based on the notes she took. When she's working on an article for her courses, she has Word open on her laptop and the highlighted paper copy on her desk. She organizes her school work on her laptop by years, semesters, courses, and assignments so she can easily find anything from classes she's taken. Occasionally, when she's working on something that she thinks will useful in her professional career, she saves it twice so she can also find it by the related topic. To keep her busy schedule straight, Ashley prints out her Google calendar every month and puts it up on the wall in her room. She puts the due dates for the assignments, social events, and school-related events on the calendar. She has a mix of group and individual work for her classes. So far she's had at least one group project in every class. Group work can be challenging for her since she lives off campus. The other students usually want to meet in the evenings. So she tries to have group meetings to plan and divide up the work, then work individually. She can always jump on IM or facebook if she has a quick question since pretty much everyone uses them regularly. Like most of her assignments, she submits the final group paper via dropbox. She likes dropbox because she can see the previous assignments already submitted. Once she's turned in an assignment she can just forget about it. She doesn't tend to follow up to confirm submission unless it is a really important assignment. She is on Moodle almost every day. So she likes to make it her own by customizing and personalizing her course sites. She picked the purple theme to go with her desktop image, and likes to rearrange the portlets on the screen. She unchecked what she calls the "useless stuff" from the list of widgets to remove them from the home page, and instead added the dictionary. She likes that she can choose whatever portlets she wants, and where to place them. Although it was difficult learning Moodle, overall she likes using it for her coursework particularly since she access her course material from anywhere. She Her biggest complaint is the many notification emails she gets for anything that is posted to the site. At this point they are pointless since she tends not even to read them because there are so many and there isn't distinction between important or time sensitive ones versus more mundance notices like a new article was posted to the site.